Dale Harcombe lives on the beautiful NSW coast. She is a writer of fiction and poetry for adults and children. She’s here today to talk about her book ‘The Goanna Island Mystery’ and particularly to focus on the importance of setting. Legend says that the ghost of a pirate haunts the tiny Goanna Island. Leo, new to the area, decides to investigate one day, when the local bully dares him to visit the island. Leo doesn’t really believe in ghosts — until he sees a pale face peering at him from a window. Who is on the island? Are all the legends true? 1. Is the setting for The Goanna Island Mystery real or imagined? Goanna Island is a combination of two real islands with some imagined. One island was up at Fingal Bay and unless you went by boat it was only accessible at low tide.. The other is in Sydney Harbour. I added the Goanna shape to make the island even more Australian and not tied in to any real place so much. or are they total invention? I often use real life – The setting for Chasing After the Wind was very much real life. I lived for many years in Western Sydney, so knew the Parramatta/Granville area well. Much of the research of Parramatta in the Depression came from Parramatta library and from local newspapers of the time. In Lights, Camera Action and Saltspray Idol, two books coming out later this year, even though the setting is imaginary, Saltspray is not too unlike some of the areas around where I live. However, part of Saltspray Idol is set in Sydney. That is based on many years living in Sydney, so is firmly in the realm of reality. In Karaoke Kate it was a totally imagined farm. Red Alert! was based on a real camp, but of course the name was changed and some of the details and incidents invented. Sometimes it’s hard to remember what actually happened and what was imagined. Novels I have written for adults tend to be a combination of real and imagined setting too..
What is the most challenging part of creating an appropriate setting for your stories? The most challenging part is making the setting believable. The author firstly needs to be able to visualise it, so that they can then convey enough of the specific details to ensure the reader can visualise the scene. Setting can play an important part and in a way be almost another character. For a story you need plot, character and setting. In what order do you develop these? Mostly I start with character and then see where that character takes me. But in The Goanna Island Mystery it started with the island, which is what I mean about sometimes the setting becomes another character. In Chasing After the Wind I specifically wanted to write about a child from Western Sydney because I think Western Sydney is not well represented in children’s fiction. Having lived there for many years I know some of the strangely held attitudes, even people from other parts of Sydney can have to Western Sydney and those commonly referred to as ‘Westies.’ The experience of living in Western Sydney is often quite different to people’s perceptions and the media’s portrayal of the area. Sorry, that’s a little bit of a hobby horse of mine. What aspect of setting is the most important for you? The physical surroundings or the atmosphere, or are they indivisible? They all blend in a bit. I try and use the senses as much as possible. Not just the visual but the sense of smell or taste or hearing. They are the details that make a setting come alive. Do you ever reuse settings? I did re-use one setting in two young adult books, which tied them loosely together as a series. They were to be published until the publisher went bankrupt. For the moment, they’re still bottom drawer dwellers, something I suspect all writers have a few of. One day they will emerge into the light. Term 3 will see the publication of Lights, Camera, Action and Saltspray Idol. Like most writers I have manuscripts with publishers awaiting the green light and several projects at various stages of writing or re-writing. 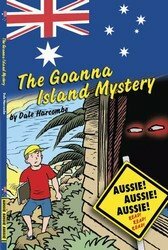 Otherwise The Goanna Island Mystery is available from Blake Education RRP $9.95 Here’s the link to the site. SCBWI Victoria held their latest meeting in Geelong in a back room at the gorgeous Griffiths Bookshop. In among books coming and going, we talked about writing and illustrating and books and awards and more. I introduced a segment (hopefully ongoing) designed to learn a bit more about how we work. Also hopefully to help us all understand how much in common we have with each other, no matter the style of our work. The first ‘Just A Minute…’ asked attendees to share what they do when they receive a rejection, citing the example of one writer friend who ‘kicks a chook off a fence’!! Walk dogs. Eat chocolate. Keep writing. 1. 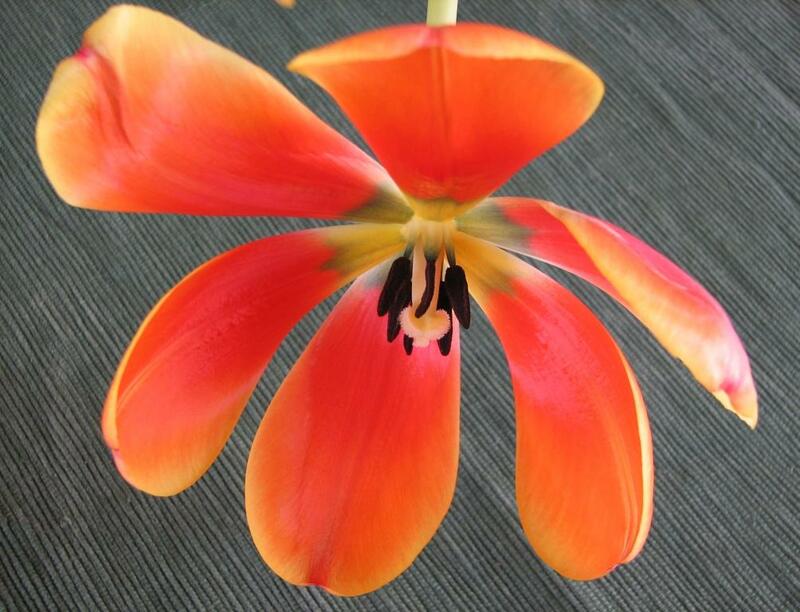 Sulk – fire off an email for sympathy 2. Eat 3. Rework and resubmit. Play Spider on the computer over and over until numb. Sit down and read one of my older accepted books, or some of my older acceptance emails to remind myself that I’m not such a bad writer. I reread my submission and remind myself that it’s really VERY good – I tell my kids I got a rejection and they remind me that I’m really VERY good. Then I sulk for a while and tell hubby we need to get take-away for dinner because I can’t bring myself to cook. Because there have been so many (but luckily quite a few acceptances too) I just toss it aside and move on. 1. Say Bugger! – not just once. 2. Put the envelope and ms where I can’t see it. 3. Days later look for it and see if I can improve the ms. I actually expect to be rejected so am not surprised when I am – can move on quite quickly. Tend to send stuff out again immediately as I like to live in hope. The last time I was rejected, I agreed with the editor’s assessment of my work and asked her if she wanted me to have another go. She didn’t. When focused and positive, I send out another story, or send the same one to someone else. If I get too many rejections at once, I just get disheartened. I debrief with others. Complain bitterly. Then put it aside. Welcome to the world of bandicoots! There are less than 200 left on mainland Australia and some of them are here. All are in predator-proof fenced areas. 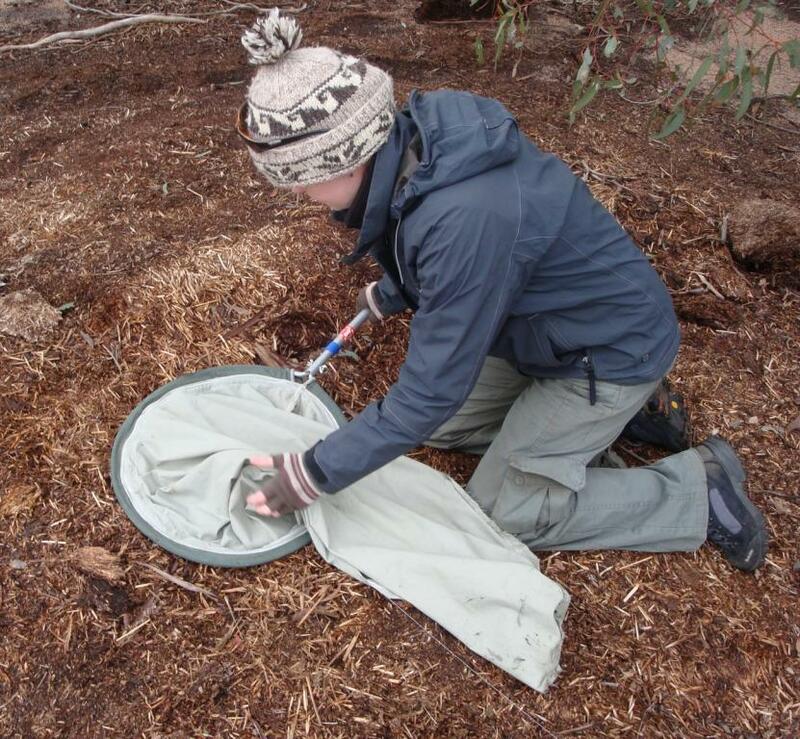 My friend Jackie and I went out to Mt Rothwell, south-west of Melbourne to help Amy find some Eastern Barred Bandicoots (EBB), the subject of her research. Amy was confused (me too) when the antennae led us to this open spot. 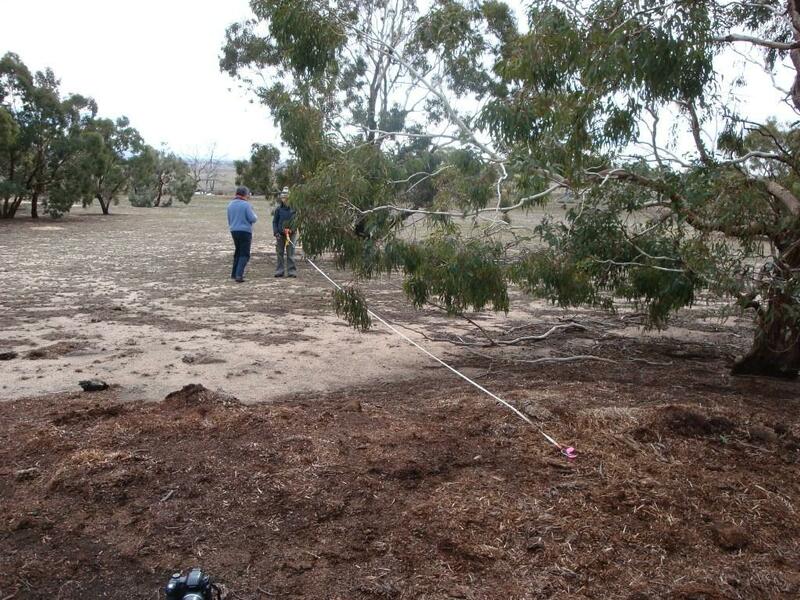 Bandicoot nests are tricky things to find even with the radio signal, but this made no sense. Until we found the shed radio tag, dust covered and ground coloured. Clever bandicoot. 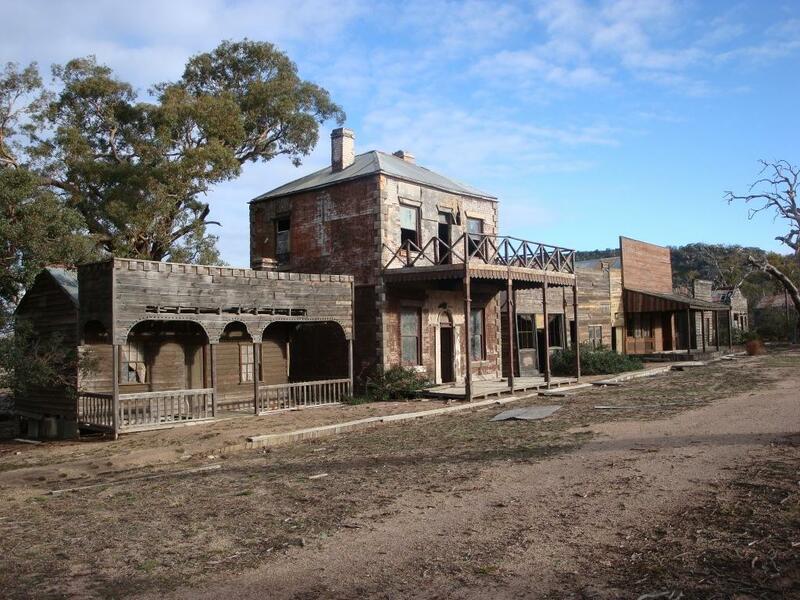 This is Kellytown…aka the film set for the last? Ned Kelly film. 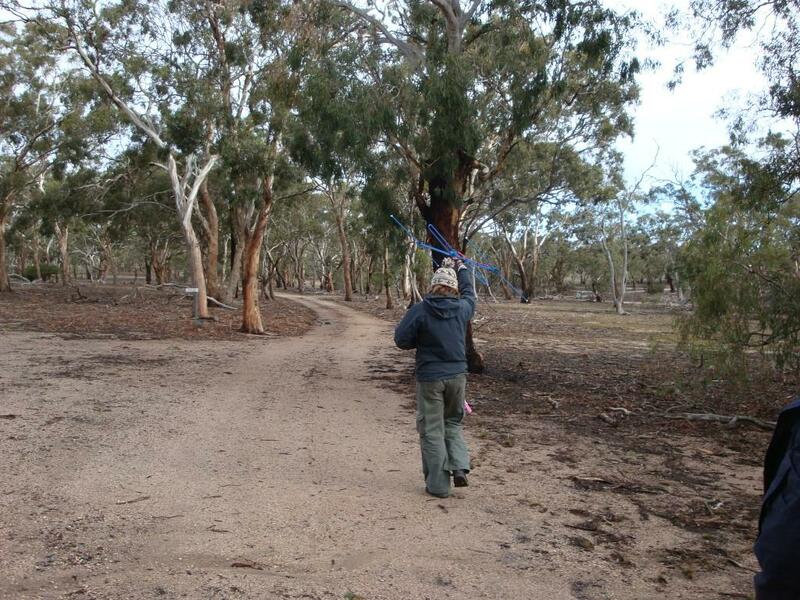 No Kellys here now, only pademelons, bandicoots, kangaroos and wallabies. Can you see the nest? It’s there…really…where Jackie is pointing..
Can you see it now? 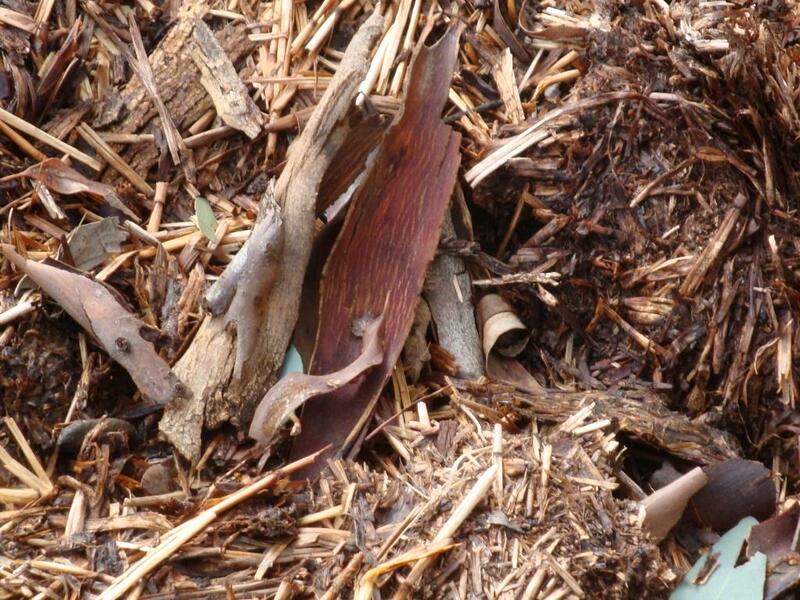 Bandicoots make shallow nests, and pull ground litter over them. Even when you know it’s there, it’s almost impossible to tell. 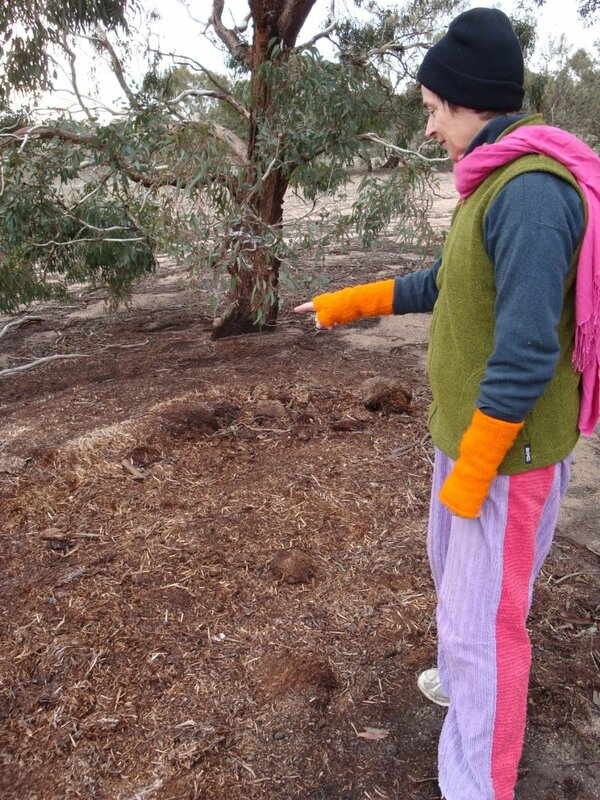 This nest was previously home to one of the tagged bandicoots, but another untagged bandicoot saw the opportunity and made it his own. 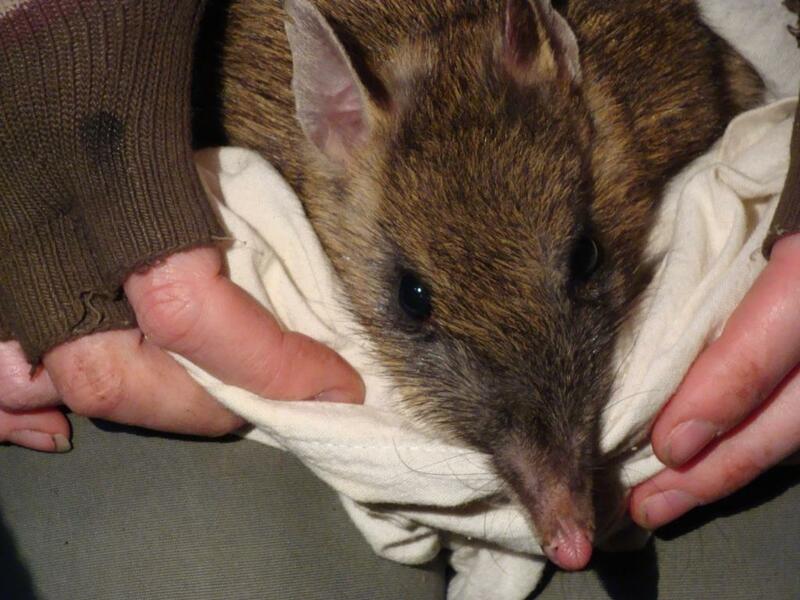 Bandicoots generally nest only one night in a nest, although they may return sometimes a few days later. Then to tag. 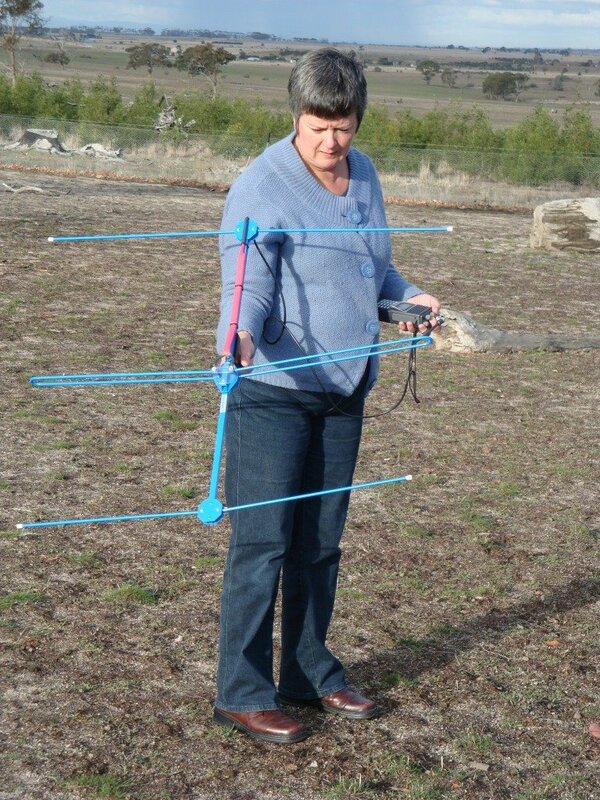 These radio tags weigh only a few grams and are attached to the bandicoots tail. 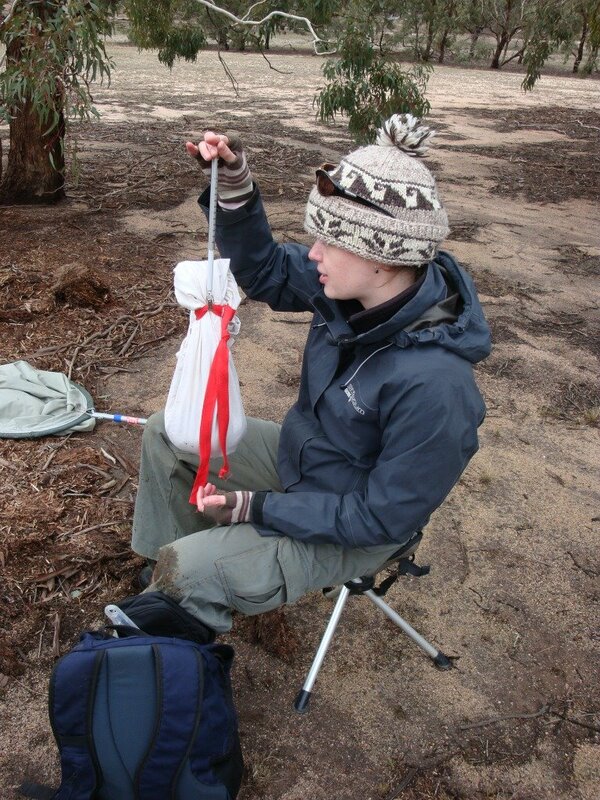 Although the tags will transmit for several months, the bandicoots seldom retain them for more than a few weeks. Then you let him go. 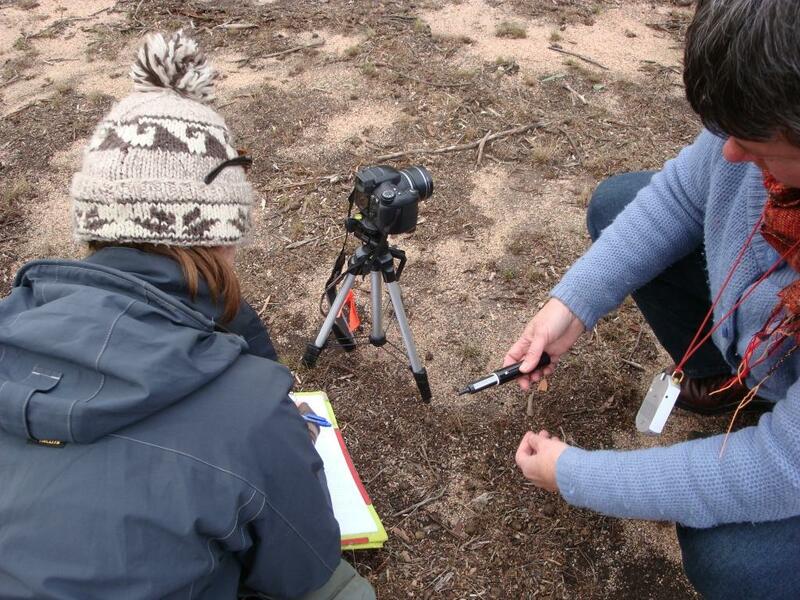 using a penetrometer to measure ground hardness, looking at how visible the nest is, ground cover and more. 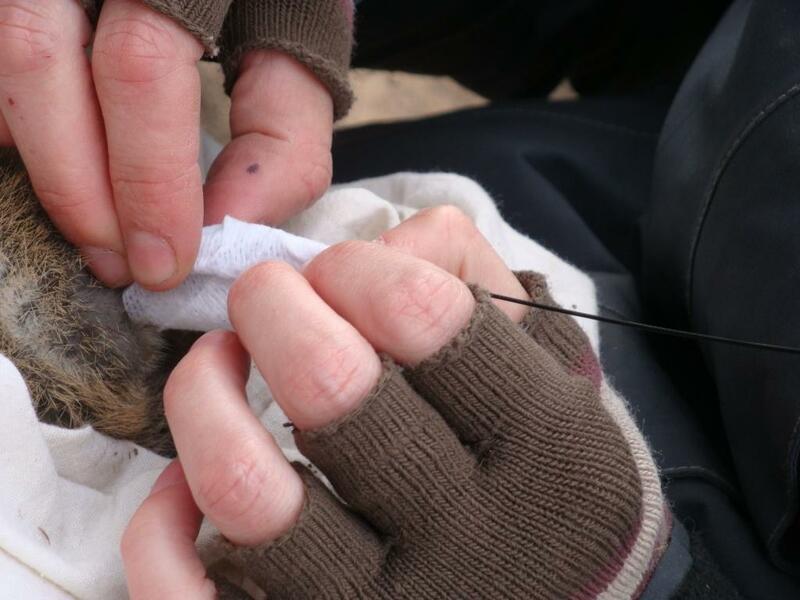 It was an amazing thing to see and even handle these tiny shy creatures, but also an education to see just how a recovery program works. Sally Murphy is a Western Australian poet and author of children’s and educational books. She is also a teacher, book reviewer and mother of six. Pearl Verses the World is her twenty eighth published title. Welcome Sally. You live in a small West Australian town. Do you see any benefit, tangible or otherwise, in promoting your work locally? The benefit of promoting locally is that when people know an author in person, they are more likely to seek out and buy the books. So, yes, there’s a tangible benefit – promoting locally can and does lead to sales of my books. There’s also a less tangible benefit. When people know that I’m an author, they tend to be supportive and interested in my work. This doesn’t just make me feel good about myself (which is nice, of course) but also helps keep me writing. When people ask about my writing, and know I’m an author, then that’s motivating to keep writing, so I can honestly say I am an active author. Having said that, there is a risk of over promoting. I live in a town of less than a thousand people. To be constantly advertising my books to them, or trying to handsell to them would lead, I think, to author fatigue. I’m particularly aware of that in my local school – where I also teach one day per week. I want t the students to be excited by my books, so that their love of reading grows, rather than jaded by over-exposure to me. So, I try to use my books and my writing only as a special thing rather than a regular part of classes. Some of the things I have done locally to promote my books include running writing workshops, talking a Rotary Club dinner, and presenting at our local Young Writers’ Festival. What’s the most rewarding promotion activity you’ve been involved in? The least rewarding? Most rewarding – school and festival visits. I love talking to (and with) kids about my books, and about reading and writing. I am a bit of a performer, and although I get nervous, I get a real adrenalin rush and tend to be very energetic in my presentations. I love drawing kids in with readings, telling them stories about my life and the writing life, and responding to their questions. I love walking through a school or festival and hearing a child say ‘there’s Sally murphy’ like I’m someone famous. It makes me feel valued – and keeps me doing what I do. I honestly can’t think of a least rewarding activity. I tend to think of any promotion being good promotion – even if you don’t always see the benefits instantly. If it gets your name out there and tells people about your books, then it is probably good. Does ‘rewarding’ equal ‘successful’ in promotion? Not necessarily. I’ve mentioned things like school visits which are really rewarding. But it isn’t easy to measure whether these have been successful in terms of generating sales. The reward comes from knowing you’ve inspired or motivated children, or, if you conduct writing workshops, seeing the children working hard to produce something. In fact (and I’m drifting towards the next question here, I know), it is hard to measure the success of most promotional activities, but you can know whether they were rewarding in terms of gaining feedback, intrinsic motivation and so on. How do you measure the success or otherwise of a promotional activity? As I’ve just said, it is hard to measure success. I suppose the true measure might be in whether a promotional activity results in increased sales. Unfortunately, for the most part, sales figures only come once or twice a year (with royalty statements) and so it is hard to know which sales were the direct result of a particular promotional effort. Mostly, I think good sales figures will be an indication that the combined promotional efforts for that book have worked – but can also be in part a sign of whether your name is becoming known and people are seeking out all of your books. There are, however, times when you can measure success more directly, through sales figures. If you present at a festival or conference you can usually see the sales figures tied to that event – either by studying your royalty statement when you get it, or by speaking to the booksellers at that event. When I promote online using my blog, I use my stat counter to track whether a particular activity has resulted in more hits (visits) to my blog. Stat counters also allow you to see where visitors came from and where they went after visiting your site, so you can see, for example, if they go from your blog to an online bookstore. Does emotional success of an activity always equal the more tangible book sale success? No. Some events will result in lots of good feedback, back slapping, nice emails and so on – but few book sales. And I have had the experience of working hard to promote a book, and getting good feedback, but that book not selling its initial print run. The problem there was that I was working to promote it (as was the publisher) but there were problems with distribution. All the promotion in the world won’t lead to sales if people can’t find the book in bookstores. That was really disheartening. You are developing quite a body of work, which will increase in the next year or so with several more works in production. Are you feeling a change in the way you promote…promoting yourself as an author rather than promoting an individual project? Or is your promotion project-based? How do the two approaches differ? How much do you feel they overlap? A body of work – I like the sound of that. Pearl Verses the World is my twenty eighth title, but with many of those 28 being educational titles, and Pearl and my forthcoming titles all being trade titles, there is a shift happening in the way I promote. I haven’t tended to promote my educational titles very much, because these are generally hand sold as series straight into schools. There is little point promoting them to the general public as they can’t easily access them. My previous trade titles – Doggy Duo (2003), The Floatingest Frog (2004) and Pemberthy Bear (2006) came out far enough apart for me to really need to promote each title by itself, although certainly with the second and third I was also still promoting the earlier titles. Now I have four more titles coming out in the next two years, and I find that promoting myself as an author is really important so that all my books benefit – backlist, current titles, and forthcoming. So, I try to keep my name ‘out there’ as much as possible – through my blog and website, through contributing to newsletters, through school and festival visits and so on. I want people to be looking forward to reading the next book by Sally Murphy, and to be seeking out my past titles. At the same time, each new title needs and deserves its time in the sun. At the moment, for example, the majority of my promotional efforts are going to promote Pearl Verses the World because it is brand new and exciting and I want to give it the best shot at success that I can. It’s also important that the uniqueness of each title is recognised. The way I promote Pearl, which deals with some serious topics, will differ from the way I’ll promote my Christmas picture book, Snowy’s Christmas, later in the year. The two do overlap because every time I promote a book I am still promoting myself as an author. You just need to look at this interview as an example – this interview is part of my blog tour to promote Pearl Verses the World, but I have talked about several of my other titles and LOTS about myself, too. Talking about any one book requires a look at the writing process and myself as author, which in turn does promote my body of work. Promotion often requires an author to step outside their comfort zone. How do you manage any nervousness when promoting your work in person? Is promoting on line more comfortable? I think nerves are a good thing. I use the nervous adrenalin to fuel my presentations. I find if I’m not a little bit nervous then I feel flat, and wonder if that shows in my presentation. Having said that, being over-nervous can be damaging, so I try to keep calm by being organised, dosing myself with Rescue Remedy (a Bach Flower remedy for nerves and trauma) and some deep breathing. Promoting online can be comfortable because you don’t have to face people in person and you can often do things at your own pace. Online promotion is also very convenient for me because I live in the country. What promotional activities have you planned for Pearl? Most of my promotional activities for Pearl are online and centred around my blog. I am aiming to post something new on my blog every day this month, focussing on poetry in all its forms. This blog tour, spanning ten days, is also a key part of trying to build some interest in the book. A fellow author, Kathryn Apel, is joining forces with me to run a verse challenge on both our blogs. I’ll use my blog also to link to reviews and interviews so people can keep in touch with any publicity (hopefully there’ll be some). The wonderful publicity people at Walker Books have also been busy sending out review copies to newspapers, magazines, websites, radio stations and so on. As a result of this Pearl is being featured in an article in Practically Primary magazine next month. Walker have also produced wonderful teacher’s notes (which I contributed to) and a letter to teachers and librarians. These will be available on my website and Walker’s website, as well as at conferences and so on. In person, I have school visits coming up, where I’ll promote Pearl alongside my other books. I am also presenting at the Corrigin Young Writers’ Festival alongside Matt Ottley, and am looking at officially launching Pearl there. Hopefully all these things will get Pearl noticed and out there. At school, Pearl feels as though she is in a group of one. Her teacher wants her to write poems that rhyme but Pearl’s poems don’t. At home, however, Pearl feels safe and loved, but her grandmother is slowly fading, and so are Mum and Pearl. When her grandmother eventually passes away, Pearl wants life to go back to the way it was and refuses to talk at the funeral. But she finds the courage to deliver a poem for her grandmother that defies her teacher’s idea of poetry – her poem doesn’t rhyme; it comes from the heart.